Patrice Bergeron could rejoin the Bruins' lineup Sunday night against the Wild. 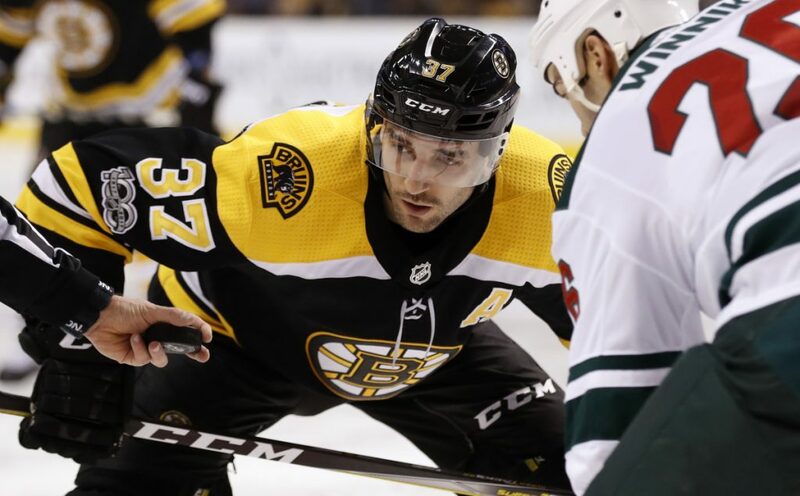 DALLAS — Boston Bruins center Patrice Bergeron, who has missed the last 14 games because of a broken foot, met Friday with doctors and got the go-ahead to travel and meet the team in Minnesota. “He’ll skate on Sunday morning and he’ll be a game-time decision on Sunday night (against the Wild),” said Coach Bruce Cassidy following the Bruins’ 3-2 comeback victory Friday night against the Dallas Stars. Saturday was a scheduled day off for the Bruins, and with the team playing games every other night right now, practice time in general is going to be scarce. But Bergeron got in at least one practice with the Providence Bruins this week, and that might allow him to be plugged into the lineup right away. Cassidy said defenseman Zdeno Chara – out the last five games because of an upper-body injury – has begun skating, and rookie defenseman Charlie McAvoy could begin skating as early as Saturday. McAvoy has been out since suffering an MCL sprain March 3 and has missed the last 10 games. Rick Nash and Jake DeBrusk have not yet begun skating, and Torey Krug (upper body) is with the team and skating. Krug could be available for Sunday’s game. DEVILS 2, LIGHTNING 1: Keith Kinkaid made 35 saves and New Jersey took another major step toward making the playoffs for the first time since 2012 with a victory over visiting Tampa Bay, which remained four points ahead of the Bruins for the No. 1 seed in the Eastern Conference. MAPLE LEAFS 4, RED WINGS 3: Nazem Kadri scored with 7:26 left in regulation, helping Toronto extend its club-record home winning streak to 13 games. Kasperi Kapanen, Connor Brown and William Nylander had the other goals for Toronto, which also tied a franchise mark with its 45th win. CAPITALS 6, CANADIENS 4: Evgeny Kuznetsov and Tom Wilson each scored twice, and Nicklas Backstrom had four assists as Washington strengthened its grip on first place in the Metropolitan Division with a win at Montreal. AVALANCHE 2, GOLDEN KNIGHTS 1: Gabriel Landeskog beat Marc Andre-Fleury with a nifty move in the shootout and Colorado kept expansion Vegas from clinching a playoff spot by beating the Golden Knights in Denver. PANTHERS 4, COYOTES 2: Denis Malgin snapped a tie with 3:45 left and Florida overcame a two-goal deficit by scoring four times in the third period at Sunrise, Florida. BLACKHAWKS 3, ISLANDERS 1: Anton Forsberg stopped 28 shots to help Chicago snap a five-game losing streak with a win at New York. SHARKS 5, FLAMES 1: Evander Kane scored twice to give him six goals in his past two games against Calgary, and San Jose won its seventh straight game, beating the visiting Flames. Kane followed up his four-goal performance in Calgary a week ago by scoring a short-handed goal in the second period and another goal in the third. BLUES 2, BLUE JACKETS 1: Jake Allen made 33 saves, and Alexander Steen and Vladimir Tarasenko scored as St. Louis won at Columbus, Ohio, stopping the Blue Jackets’ 10-game winning streak. RANGERS 5, SABRES 1: Jimmy Vesey had two goals and an assist, Alexandar Georgiev stopped 43 shots and New York won at home. HURRICANES 5, SENATORS 2: Phillip Di Giusseppe and Jordan Staal each had a goal and assist to lead Carolina to a win at Ottawa. WILD 4, PREDATORS 1: Devan Dubnyk stopped 19 shots, and Jason Zucker scored his 30th goal and added an assist to lead Minnesota past visiting Nashville.